Discussion in 'Conspiracy Theories' started by Mick West, Jul 27, 2015. 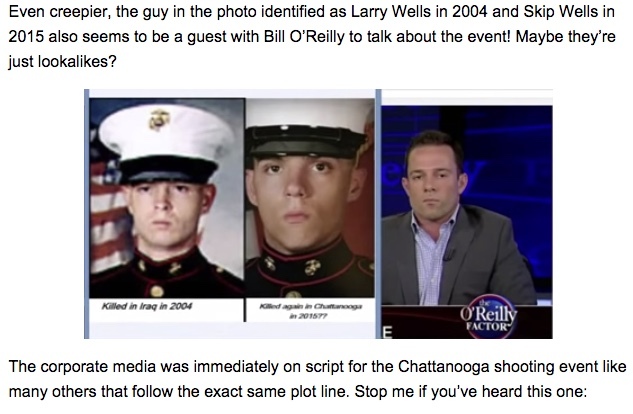 Several "alternative" media outlets are repeating the suggestion that that the Chattanooga shooting incident at a Marine recruiting office was staged. 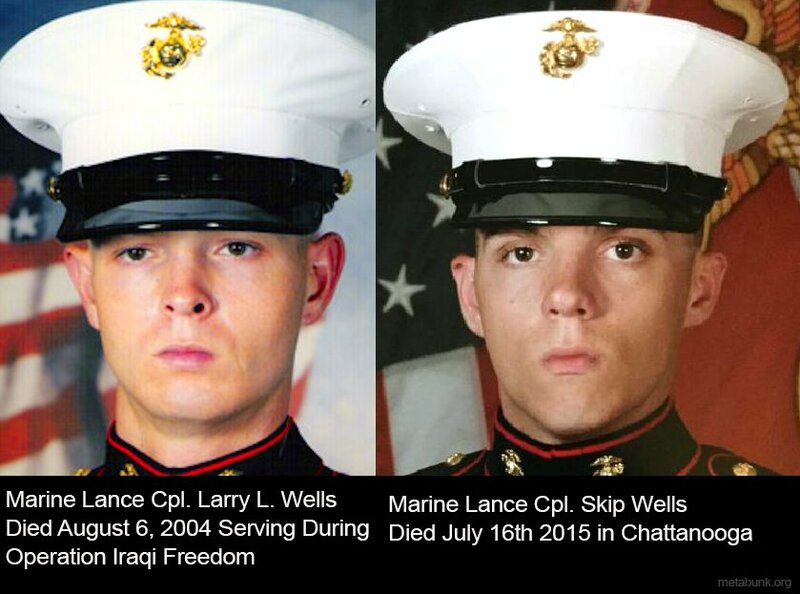 As evidence they offer blurry photos of one victim, Skip Wells, and another Marine with the same last name, who died in Iraq in 2002. Even the low resolutions images don't look that similar, except for being young white males in the same uniform. But the higher resolution image (top) shows that they are different people. If you can't tell immediately, then look at the ears, and the spacing above and below the mouth. 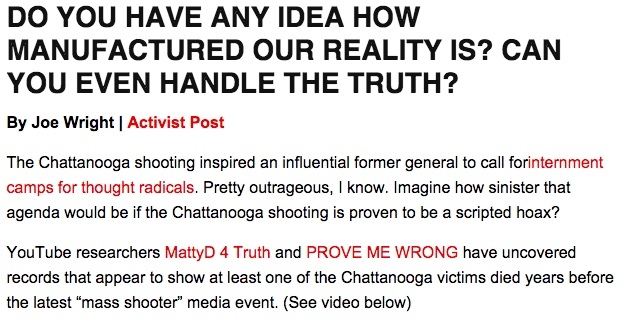 The "False Flag Crisis Actors" type of conspiracies are nothing new, and they generally represent the fringes of the conspiracy movement. It the type of person who think that no planes hit the World Trade Center, and that all mass casualty incidents (Sandy Hook, Boston Bombing, Aurora shoot, etc) were somehow faked. Generally these photo comparisons are so specious that I'm unsure if it's even worth addressing. But then I see people sharing the basic story of Facebook, and I see it creep into the slightly more mainstream "alternative" media sites, and I think it's something that should be corrected, even if only to show just how off-base the evidence for these theories really is. In this case the story is being prompted by the Intellihub web site, owned by Shepard Ambellas, who previous did some reporting for Alex Jones' Infowars site. Intellihub got the story from Activist Post, which appears to me to be little more than a clickbait site. Perhaps even more bizzare though, is the suggestion that a third person was being played by the same "actor"
That person is Brad Steinle, the brother of Kate Steinle, who was allegedly killed by an illegal immigrant. 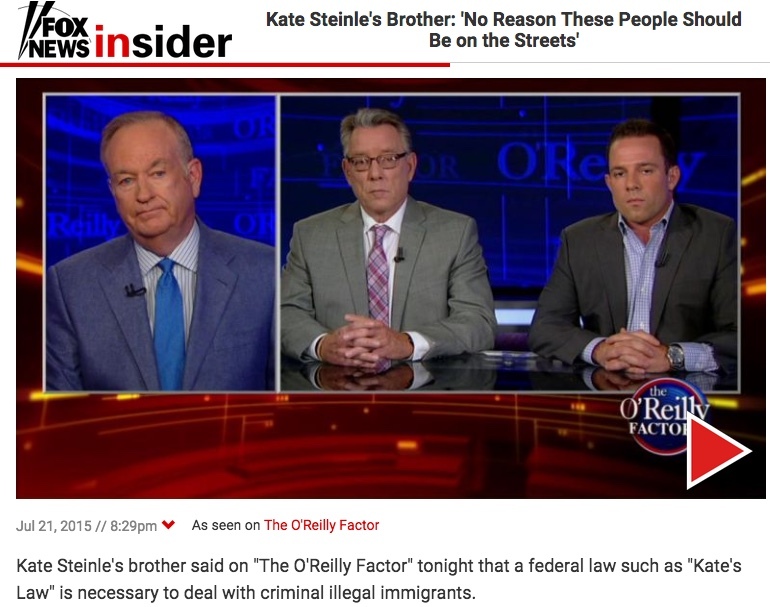 He was on O'Reilly to discuss thougher action on illegal immigration, and his appearance had nothing to do with the Chattanooga shooting. And perhaps more to the point, he looks nothing at all like Larry Wells, or Skip Wells. Good work Mick. Conspiracy theorists THRIVE off of finding identical looking people. on a scale of 1 to 10 on how difficult it is to do that, it's probably only a 4 if you got atleast a dozen people in the conspiracy industry working on it. It is ironic to constantly hear alternative websites and CT believers constantly denounce the "manufactured truth." I have to wonder if the problem is the result of willful ignorance or deliberate action. With respect to some of the long-standing "news" sites like InfoWars, I would have to think the latter applies. I just don't get it. Infowars says it opposes illegal immigration and is also on the "creeping sharia" conspiracy bandwagon, yet here they are accusing a man who was killed by an Islamist terrorist and another man whose sister was killed by an illegal immigrant of being fakes (and of being the same "crisis actor"). True, but you are applying consistent, rational standards. Alex Jones is a contrarian interested in stirring the pot (for whatever ends), not following common sense, logic, rules of cause and effect, evidence, etc. This isn't Infowars, it's Intellihub. Shepard Ambellas is more alternative than Alex Jones. I see. Jones is just as contradictory, though.